An Interview with Colman McCarthy. · One Book. One Author. One Hour. An Interview with Colman McCarthy. 1:37 – McCarthy is not certain how his book came to be on Booknotes, but he had appeared previously on CSPAN and taught one of the other CSPAN on-camera personalities at American University. 2:22 – Because he watched the program he knew what to expect and knew that it would be a well-done interview. Because of this he was not nervous and did not do much to prepare. 3:48 – McCarthy remembers most the cupcakes and other sweets that CSPAN had in their greenroom from his appearance. 6:59 – McCarthy does not think that there are drawbacks to the hour-long format. He thinks that this is how all interviews should be done because you are able to go into so much detail. Because Lamb isn’t partisan, there is no sense that he is using you for an end, making the interview process less competitive. 9:09 – The amount that Lamb prepared for interviews is unusual. His preparedness was clear from the very starts of the interview. Lamb also goes beyond the book in his preparation, looking up clips from past interviews to learn more about the author. 12:13 – McCarthy was not surprised by being asked biographical questions because he is a faithful viewer of Booknotes. He even brought along pictures of his family to show on the air. He thinks that including an author’s biography is important to get a fuller understanding of where the author is coming from. He finds the fact that other interviewers, especially in shorter programs, do not go into this detail to be a shortcoming. 14:35 – Appearing on the show did not change his opinion of the program. It was a great privilege to be there. 15:22 – McCarthy thinks that the Booknotes Collection is a wonderful resource in an increasingly digital age. 16:38 – McCarthy would have absolutely returned for another interview if asked back. 16:48 – He is not certain whether his appearance on Booknotes impacted his book sales. 17:35 – McCarthy felt that he learned about quality television from his experience appearing on Booknotes. 18:56 – McCarthy is currently working on a book entitled Teaching Peace. Since his appearance on the program he has been a columnist and teacher. 22:16 – McCarthy thinks that an important missing piece of the Booknotes legacy is that Brian Lamb himself has not been interviewed. McCarthy would like to undertake that task. Lindsey Bestebreurtje (Oral Historian), “An Interview with Colman McCarthy.,” One Book. One Author. One Hour., accessed April 24, 2019, http://booknotes.gmu.edu/items/show/2778. 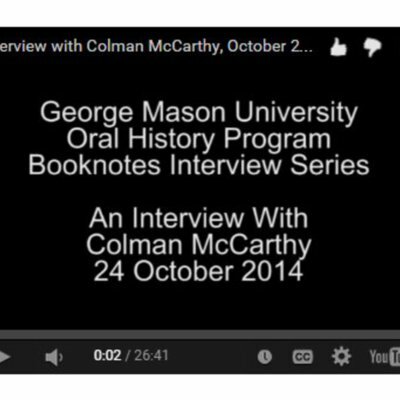 Colman McCarthy is interviewed as part of the Booknotes Oral History Project on 24 October 2014. Mr. McCarthy discusses his appearance on C-SPAN's Booknotes program on 31 July 1994, where he discussed his book "All of One Peace: Essays on Non-Violence." Booknotes Oral History Series. R0143 Box 02 File 03.